I’ve found a charity! I was researching to see if Scotland had any squirrels and it turns out that the country has been over-ridden by invasive, non-native gray squirrels who carry a virus that is deadly to the red squirrel. Don’t you just hate it when nature is that unfair? I did some more research and found out that Chuck (Prince of Wales) is in on this one -- he might actually do some good. I donated some money and purchased an item from the gift shop. I was mightily tempted to get the red squirrel tin sign (survives all “weathers”) but I do not wish to antagonize the gray squirrels that have overrun my property. Sometime in July, the largest gray squirrels that any observer has ever seen perch themselves onto the boughs of my walnut tree (English walnut grafted onto black) and they hungrily, nervously, quickly chew the green shell down to the even greener fruit. A neighbor once told me that she hopes they got a very bad intestinal sickness, although her words were far less elegant. In fact, they were vile! My first beagle, Bonnie, was a fierce tree-er (superior sense of smell). 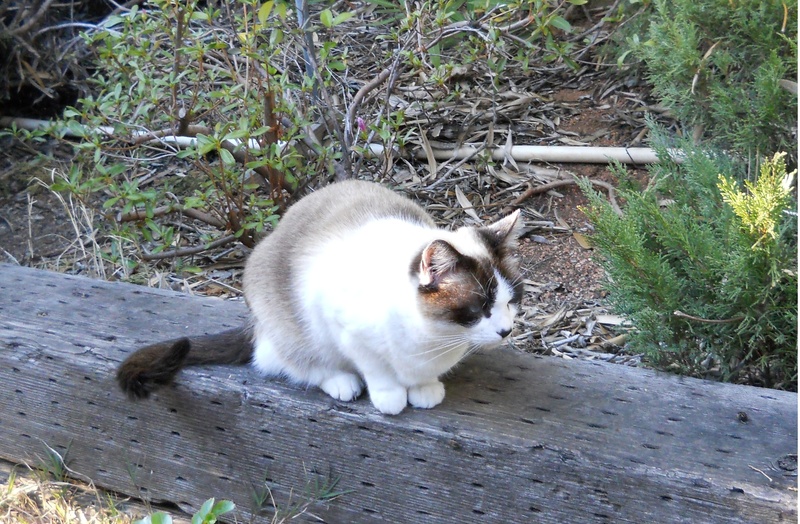 She had a very salutary effect on the hunting instincts of Bootsie who, truth be told, did not possess the finest sense of smell (it should not happen to a dog, especially a scent hound). After the departure of Bonnie from earthly existence, Bootsie was downright depressed and so little Bridget Louise came home one night. I held the tiny thing (“the size of a cucumber” a friend commented) to Bootsie to see. He widened his eyes and looked at me. I am quite sure that he believed I’d brought home a tri-colored hamster. But Bridget took to Her Hero as if she was born to love him! She certainly was born the alpha female of the pack. The breeder/owner was somewhat overjoyed that we selected the most aggressive and energetic of the seven pups. Of course, I’d immediately gone to the runt of the litter, just to hold it and let it know that it was loved, before setting her down to inspect the fur-bearing attitude that my husband had selected. I remember saying, after watching her behavior with the litter, “She’s a little firecracker.” This incredibly small puppy was attempting to dominate every other pup, but her special objective was the one that I called “Marie Antoinette” because unless we removed this tri-colored threat from her life, this pitiful puppy was not going to have any head left! Bridget is now on her own to tree the squirrels. She did make a go at one huge squirrel last week. I praised her and then I contemplated about how it has been over a decade since we have been able to harvest walnuts from our massive tree. The gray squirrels reap their harvest by September although the nuts are not ripe to eat until sometime around Thanksgiving. There is supposedly a California red squirrel, but I’ve yet to see one of these critters that might help to redress the balance of those purloined nuts. 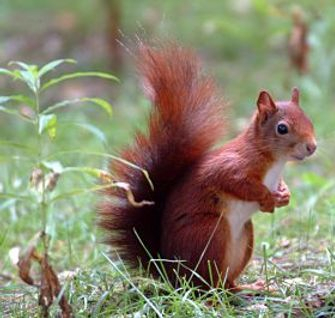 To return to my charity, the Red Squirrel Project of the Scottish Wildlife Trust. The Trust is a fine organization for truly worthwhile causes. I was alerted one morning recently about the BBC Wildlife Magazine Online Poll -- with thanks for voting (most unfortunately, I missed that voting opportunity). “To all of those who responded to our appeal for votes to help decide a national species for Britain - a huge thank you. The results have been declared and sadly, the red squirrel did not win. The public went with the hedgehog and the red squirrel, having secured 730 votes, was in 4th place. You can see a full report of the results in the current edition of the BBC Wildlife Magazine. However, there is good news to come out of this slight disappointment. The poll has been followed up with a fantastic report and superb images of our much-loved red in the next edition of the BBC Wildlife Magazine. Our team in northern England (Red Squirrels Northern England) helped in the production of the feature and there are also mentions about the project in Cornwall and much more . . . 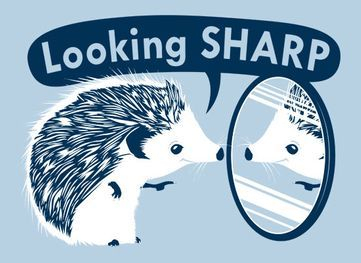 So while the British public went with the hedgehog (instead of the red squirrel) for the national species, neither the hedgehog (not the most cuddly of creatures) nor its supporters was demonized, vilified, or accused of insensitivity to the plight of The Red. Cheerio to the Red Squirrel Wildlife Trust! I can just imagine a special show on BBC2. The televisual feast will show the prickly thing and try to lionize it! Yes, hear him roar!